The two candidates that have moved on into the second round of the Romanian presidential election are Victor Ponta (PSD) and Klaus Iohannis (ACL). The latest partial results presented by the Central Electoral Office show Ponta with 40.33% of the number of valid votes and Iohannis with 30.44%. Although Ponta is leading by 10%, nothing is certain for the second round. Commentators suggest that C?lin Popescu T?riceanu might be appointed as Prime Minister, in return for his support for Ponta. The secretary general of PSD, Liviu Dragnea, has declared that no candidate owns the votes of the electorate, but that discussions concerning potential electoral alliances will be made. 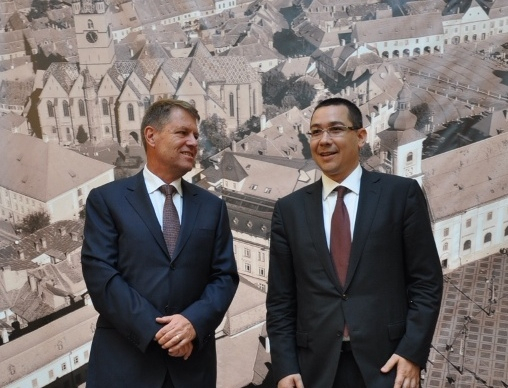 Conversely, Iohannis is expected to reach out to the rest of the former right-wing candidates and to establish a more powerful anti-Ponta coalition. That being said, no alliance is certain of victory, as each candidate has to struggle with personal problems. While the issue of corruption will remain at the center of the presidential campaign, each candidate is confronting new challenges that affect their chances for a smooth second poll. One of the main advantages of Ponta so far, apart from the formidable apparatus of PSD, was the possibility of using his daily governmental activities as part of his campaign. In this sense, the Social Democrat has promoted the correlation between the image of a functional and successful government, and the future presidential administration. However, the incidents that marked the electoral process, both within and outside the country, have had a severe impact on this strategy, as irregularities and troublesome voting procedures have inspired protests and calls for resignation. So far, the Ministry of Internal Affairs has identified 68 election-related crimes, and has started investigations against 57 persons. Most of the crimes have to do with influencing voters and double-voting. Apart from these events, voters were confronted with long waiting lines. Both in Romania and abroad, citizens had to wait for hours to get a chance to vote, and in many cases were unsuccessful. Thousands of Romanians living in the UK, France, Germany, Austria, Spain, Italy and even in the United States were unable to cast their votes due to poor organization and logistical problems. Many protested at the Romanian embassies and consulates and demanded a time extension for the voting stations, but their requests were denied. The most tense situation took place in Paris, where police intervention was needed after almost 2000 people stormed the Romanian embassy, demanding to be allowed to vote. These events have attracted protests back home as well, as the Ministry of Foreign Affairs was the target of a two and a half hour protest last night that called for the resignation of the Minister, Titus Corl? ?ean, and of the Prime Minister Ponta. B?sescu has also criticized the manner in which the election was held and has demanded the resignation of those in charge. This situation raises complicated questions for Ponta, as the votes coming from abroad have been decisive in the last presidential election. A powerful right-wing coalition coupled with a strong vote from abroad might be enough to push the Prime Minister out of the presidential race. With only a 53% turnout in the first round, and a general dissatisfaction with the manner in which the government has contributed to the organization of the election, in principle, Iohannis has the chance to reach out to the remaining 47% and to mobilize, in partnership with the other former right-wing candidates, an anti-Left coalition. However, it is unlikely he will succeeed. Among the problems that Iohannis will have to solve is that of a complicated electoral alliance with the former candidates. It will be extremely difficult to gather the support of Elena Udrea and of Monica Macovei – considering that both of them have run their presidential campaign on an ‘anti-Ponta & Iohannis’ platform. And even if Iohannis manages to attract the support of the two former candidates, it is uncertain that their electorate will mobilize for the second round. One possibility would be to raise the campaign’s online efforts, especially with the goal of reaching Romanian citizens living abroad, and appeal to the younger generation that is more active in the online environment. Social media is extremely relevant, as it has played so far a double role – that of a dissemination channel for the candidates and of a raising awareness instrument for concerned citizens. Tapping into this online potential might provide the presidential campaign with an additional edge. On the other hand, the only remaining tool of Iohannis for mobilizing the electorate, irrespective of any electoral alliances, is engaging in a direct confrontation with Ponta. So far, in an unprecedented situation, there have been no electoral debates. A standoff between the two candidates might provide enough influence to decide a victor. In spite of this possibility, it is unclear how Iohannis would perform. The ethnic German candidate has been long criticized by the Romanian media for being a man of few words, lacking in charisma. It remains to be seen whether he will be able to reassure his critics, and survive a direct confrontation with the Prime Minister. EURACTIV Romania: OFICIAL BEC ora 11.00: 98,3% din sectiile de votare: 40,33% - Ponta, 30,44% - Johannis; Turul 1: Rezultate, incidente si retele de socializare?